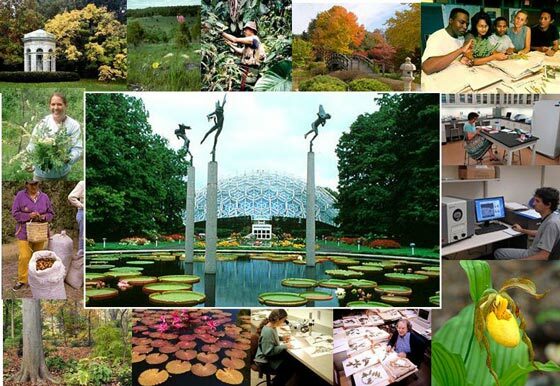 Missouri Botanical Garden is pleased to announce the opening of the Research Experiences for Undergraduates (REU) program that will provide research opportunities for 10 students, for 10 weeks during the summer of 2019. Students will work on independent mentored projects in plant systematics, conservation biology, and ethnobotany. Participants will have access to the Garden’s herbarium of more than 7 million specimens, an excellent botanical library, rich garden collections, a laboratory facilities for plant anatomy, microscopy, digital imaging, SEM, and DNA analysis, and the Shaw Nature Reserve – a 2,400 acre ecological preserve featuring prairie, forest, glades, wetlands, and 14 miles of hiking trails. Students must be returning to an undergraduate degree program in the fall following the REU program. If you will be graduating in May or June in the year of the program, you are not eligible. To be eligible you must also be a U.S. Citizen or Permanent Resident. REU interns receive food and lodging (if not local), support for research, and a weekly $575 stipend. Students will also participate in professional enrichment sessions dedicated to a variety of topics, including improving writing skills, ethics in research, intellectual property rights, getting into graduate school, taking the GRE exam, graduate school options, conservation, and sustainable living. Students will participate in weekly Lunch and Learn sessions in which these subjects will be discussed. Students will also participate in field trips to local natural areas and cultural attractions. The REU program will be integrated with other ongoing MBG programs involving herbarium and garden support staff, high school students, undergraduates, graduate students, professional botanists, educators, and visitors. How are final selections made and when will we be notified? Should I send my resume? Do I need to send transcripts from all the colleges I have attended? Do I need an official transcript, or will an unofficial one do? When is your due date? Do you take late applications?What if I am interested in just one project? Why can’t seniors apply?Do students work on one of the projects listed on your website or do they design their own project and work with a faculty mentor?Are there multiple students working with one mentor?My school is on the quarter system and ends after your start date. Can I still apply if I have to arrive late?What are your guidelines for the reference letters? MBG Mission "to discover and share knowledge about plants and their environment in order to preserve and enrich life"